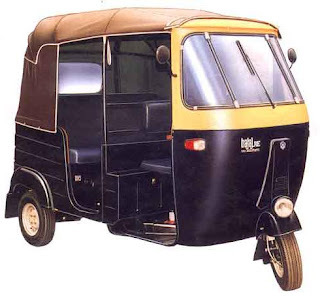 My primary mode of transportation for intracity travel was the venerable auto rickshaw. Predominantly sporting an yellow and black paint job, these vehicles occupy an unique niche between private vehicles and public transportation. The peculiar shape and sturdy frame allows for it to navigate through dense traffic and diverse terrain without a care in the world. Auto rickshaw drivers are an interesting lot. Their driving skills are usually exceptional, allowing them to maneuver their three-wheeled vehicles through the most treacherous of road conditions. Their business ethics however, are suspect. Officially only two ways to obtain a fare should be available – prepaid according to some standardized distance chart or according to the untampered meter which is to start running at the precise moment that the journey commences. In reality, it comes down to negotiating a price somewhere above what the actual rate should be. According to them, wherever you are going is either too far or too near, so you have to pay extra for the added effort or sacrifice. Your destination will also be deserted even if it is the heart of a city with over 5 million people in it. They will have to drive back empty exactly to the point where you were picked up, so that means double the fare on the meter should be paid. If you want to accompany them on this return journey though, the fare again doubles. If it rains (August – November) or gets dark (after 6pm), 1.5 times the meter should be paid due to the personal anguish and physical stress placed upon them during these difficult times. If there is a traffic jam that means they will have to wait idly by without making much headway towards your destination. This will cause them to lose potential customers, so additional financial incentive should be provided. Only 3 passengers and a driver are allowed by law unless extra moneys are provided. No change will be carried by the rickshaw driver at any time of the day or night, so the fare must be rounded up. Vehicles should only be refueled once a passenger is on board and not during the times when no passenger is present. Tea/coffee/toilet breaks and visits to shops/homes are permissible, but only for the driver. The meter may quite frequently be broken, too slow/fast, completely missing, or a figment of your imagination, so the charge will be greater. "What are you waiting for?! Run!!!" I was reeled back into reality from a dreamlike state by my roommate Shyam's screams. Looking around, I saw everyone hurriedly clearing out of the small restaurant I was in. Panic was in the air. Everyone was rushing to the back of the dining room, into the kitchen, and out through the rear exit. I quickly followed them outside into the back yard, which was enclosed on the left and right by neighbouring buildings and by a 8 ft high wall at the back. A "Where's Arnab?" query came from a familiar voice just as I saw Shyam's body disappear over the top of the wall. Several more people followed him over before I too pulled myself to the top of the ledge, using cracks in the wall as leverage to power myself up. I discovered that the distance from the top of the wall to the bottom was almost double that of what I had just climbed on the other side. The descent was not even mildly pleasurable, although it did create a healthy distance between myself and my pursuers. I slid downwards along the face of the wall before letting go and landing on the ground beneath. A sprint through deserted back alleys and over some rail lines would lead us back to the safety of our flat. Moments ago, a man with a motorcycle had come in through the front entrance of the Fraser Town eatery I had been dining in, warning everyone that an angry mob was fast approaching and to get out as soon as possible. The front shutters were pulled down as sounds of rapidly approaching footsteps, threatening shouts, thrown rocks, and heavy pounding were heard on the outside. At this critical juncture in time I had put down the food I was eating, stood up, paused, heard Shyam yelling, saw people fleeing, and joined them in beating a hasty retreat. Once I had caught my breath, I checked to see if my comrades were alright and then examined my wounds. I had scraped my arms when I had grazed the wall, with the area between my arms and elbows bleeding from several lacerations. My skin, a surface so far left unblemished by the actions of man now bore the scars of communal violence, but the injuries were mainly superficial. Questions still remained to be answered though. ARNABlood had been shed tonight, but for what and by whom?